Transform your garden shed into a chic summer house in which to relax and unwind courtesy of our handy guide. Here you'll find great advice on everything from preparing and painting your shed to insulation, storage solutions and design inspiration. Maybe you have a little table in your shed that would fit into an unused corner of your lounge, or a spare mower that could be used by someone setting up home. Once you’ve checked out your shed’s contents, split everything into three groups. Put items to sell or give away in one pile, items you're going to find a space for in your home in another, and rubbish in the third. If you’ve discovered a few gems worth giving away, list them on Freecycle or advertise them to your contacts on social media. Alternatively, head to your local charity shops. To sell your items, try ebay. It’s even worth listing old tools and lawnmowers, as there are always buyers looking for parts. Make sure you take good photographs (you can have up to 12 free images in your listing), and set a realistic starting price. If you’re not sure what your item’s worth, check out recently sold similar items. Selling online isn’t for everyone; some bargain hunters prefer to scour the local papers or rummage around at car boot sales. First impressions count. 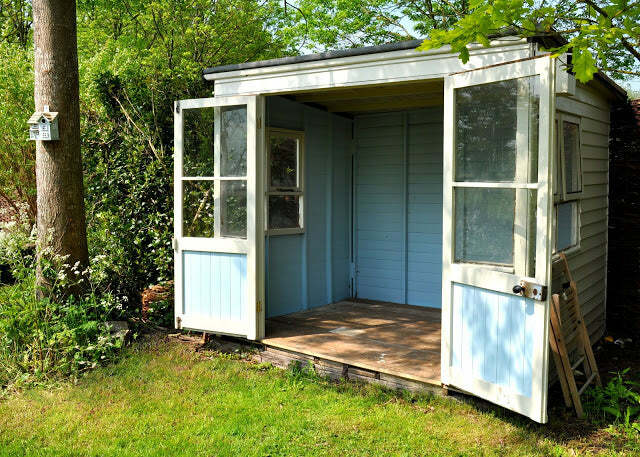 To look like a summerhouse, your shed’s exterior needs to be easy on the eye. Some simple decoration does the trick, but before you begin brandishing your paintbrush, you need to prepare the surfaces. This means removing any loose bits of old paint, dirt and dust, making sure to get right into the grooves. Use a pressure washer if you have one. Fill any gaps with wood filler and finish off by sanding down. Do also check whether the shed roof is watertight. Tears in the roofing felt could lead to leaks, so if you find any, you need to patch up or replace it. Check out our video guide to installing and fixing a felt roof right. Pick a colour, any colour. But before you do, think about how you want your summerhouse to look. If you’re a fan of shabby chic, opt for paint that’s pastel blue, off-white, dusty pink or a soft shade of green. Or why not select a shade that matches the flowers in your borders? Just make sure the paint you use has wood treatment included, to protect your shed from rot or water damage. When you’re ready to paint, wait for a dry day and apply using a brush, roller or spray. A brush is definitely better for cutting in around the door and window frames. Food often tastes better when it’s eaten al fresco, and installing decking outside your shed is the perfect way to add extra space for dining or soaking up the sun. Freshen up your shed’s exterior even more by filling flower boxes or pots and popping them under the windows. And if you run out of pots, quirky planters add charm. Worn out wheelbarrows, rubber boots or buckets are ideal for this kind of thing. Simply make a few holes in the bottom of them for drainage, and fill with soil. It’s time to transform your shed’s interior. Comfort is key and if you want to use your shed on cooler days, this means you'll need insulation. We’ll start with the floor. Vinyl is durable, waterproof and you can often buy cheap off cuts. But if your feet crave something softer, cover the floor with carpet squares. If you’re happy with a wooden floor, rugs are ideal. Jane also insulated her shed’s ceiling by stapling silver loft insulation to it. But if you want your shed to be a year-round retreat, consider paying an electrician to connect it up to the mains. A couple of power points would allow you to make a cuppa, read by lamplight and stay toasty whatever the weather. When it comes to painting the interior, choose lighter colours as they reflect natural light and add a sense of space. You want your lovely new summerhouse to be a relaxing retreat, so keep it clear of too much furniture and clutter. But even if you plan to just sit and read, you need a comfortable seat and a small table. You’ll also need storage in your summerhouse. Ideal solutions include free standing shelves, foldable furniture, multifunctional tables with drawers and stackable clear plastic boxes which save space but allow you to find what you need easily. We love jewellery designer Artemis Russell’s creative approach to storage. 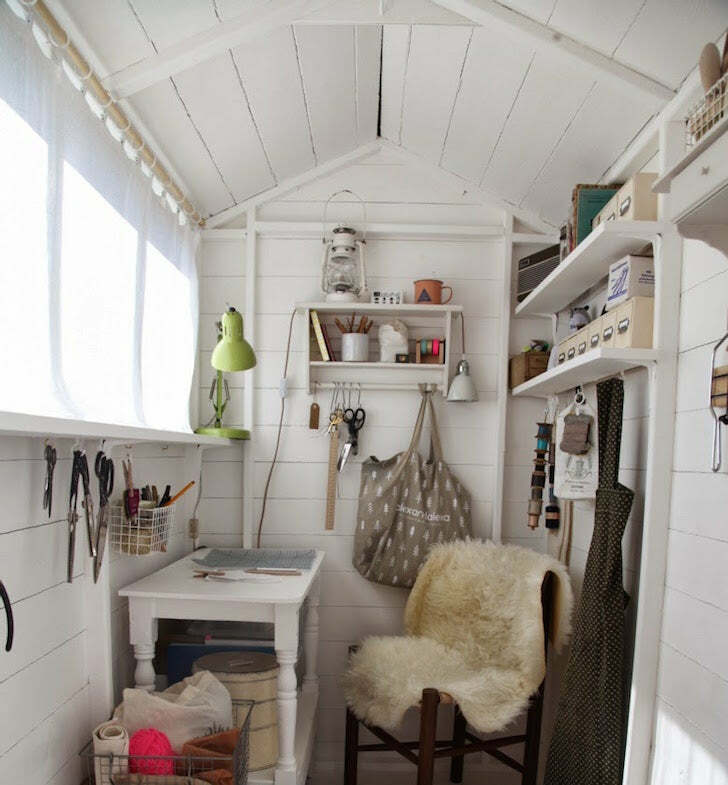 She has transformed her shed into a calm haven where she can relax while she works, so everything has to have its place. Even the ironing board! "I used to find sewing a bit annoying when I needed to iron something as I went along, and had to stop and go indoors. So I found this small folding table and made an ironing pad to tie onto it, and hung it up on the door." Her working summerhouse storage has some genius ideas. Sliding cotton reels onto knitting needles suspended from curtain clips keeps them organised as well as letting them dry properly. 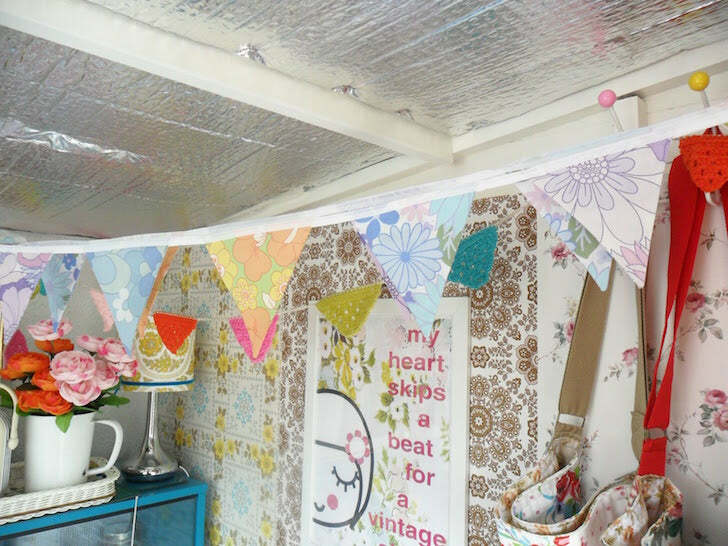 How have you transformed your shed? Head over to our Facebook page and share your images. We’d love to see them!